Lots of packages arriving in SW Michigan this week and next. Following are suggestions for dealing with a few rare, but alarming, install issues, and some key first-week advice. 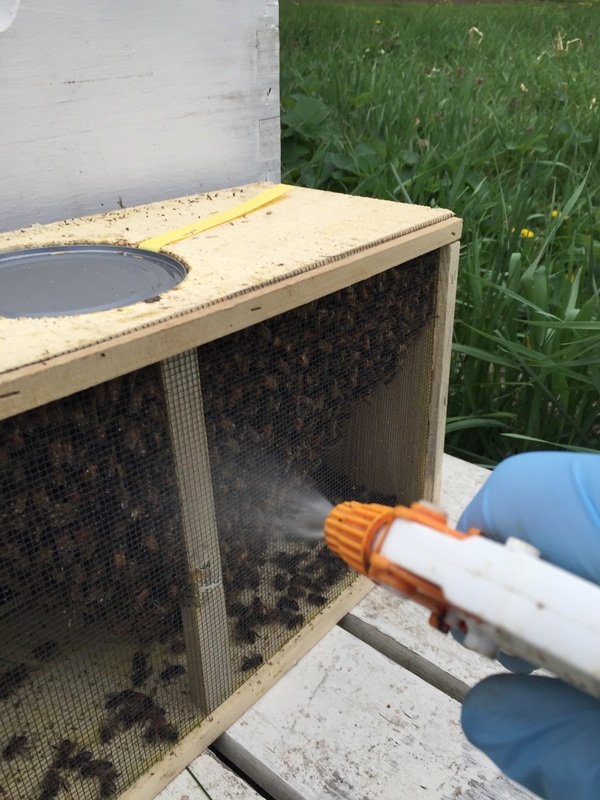 Sugar solution in a spray bottle may be used (temp over 55) to “distract” bees just before install, as well as to give them daily nourishment before they’re installed. A sealed feeder can! (NOT GOOD) This has happened to two beekeepers I’ve chatted with so far this season. While a big mistake on the part of the package producer to not punch holes so the bees can feed, it obviously happens. It means the bees haven’t had anything to eat or drink since they were caged. Because of this remote possibility, spritz the package with sugar syrup when you get them, and a few times daily if you’re not able to get them installed the same day. Uh-oh, no candy stopper! In my classes, I provide a list of what should be in your “installation kit.” Among the items – marshmallows, because if you’re removing the cork so the bees can eat the candy to release the queen, you gotta be sure there’s candy! I’ve had a couple people with that issue. It inadvertently happens – some queen cages get missed when they’re slamming thousands of packages together in the south. So if you’re letting the bees release the queen by eating the candy, please make sure there’s candy before you remove the cork. If not, stand by with a marshmallow, or leave the cork in (and direct release the queen in a few days.) Because of where Easter fell this year, Peeps are on sale now. I highly recommend having them on stand-by for the install. Any color will do, although I feel maize and blue peeps are optimal. And if there is a candy plug, bonus! You get to eat the Peeps! Temperature: “They” say you should install when it is above 55, light breeze, sunny, later in the afternoon. But, meeting all those conditions might not be possible in Michigan, or with your schedule. My advice to those of you who can’t install in those conditions is to try and hit most of them, and to install sooner rather than later. They’re just spinning their wheels and suffering more and more each day in the cage. Queenie? Oh All-Important Bee — wake up! A newbee reports a dead queen in the cage when she went to install them a day after she got them. That unfortunately also happens. Contact your package supplier to see how quickly they can get you a new queen. Entrance reducers: Reduce the entrance to about an inch, and keep it that way for about a month. It’ll take a package at least 24 days from install before a new bee emerges. Reducing the entrance helps the bees guard and regulate the temperature. At install, we loosely stuff grass in the gap. This helps hold in the all-important queen scent, and heat, and bees until they figure out where their home is. It usually wilts within a day and they will move it out of the way, and generally—the couple dozen or so bees that didn’t make it in on install will find their way. Feed: 1:1 sugar syrup as long as they take it. Which could be all summer …. and that’s fine. Let’s give them every possible advantage as they work to build up to numbers necessary for winter. And before the feed container gets slimy, clean it out. Sugar syrup can slime up quickly in hot humid weather. If you’re using a front “in the entrance” feeder on Lang equipment and therefore your entrance reducer can’t fit, use the feeder and bricks, a shim, anything appropriate to reduce the gap to about an inch. And let your dandelions grow! There are an important source of nutrition for bees trying to build-up. Inner cover with a top feeder: use it, or not? (The following assumes Lang equipment.) Whether or not depends on the type of top feeder, but you can usually figure it out by thinking about the function of the inner cover. It allows for some ventilation, it provides a buffer for temperature regulation, and it can keep beekeepers (and bees) from freaking out when you remove the top cover. If your feeder covers the frames, you probably don’t need to use the inner cover when using the feeder. Bees drowning in the top feeder: Top feeders come in different styles. There’s a trough feeder that sets either into the box, and another style that telescopes over it. Some styles have lids—which is great. Many don’t, and you’ll find all sorts of drowned bees in them, regardless of whether you use the inner cover (not necessary) or not. 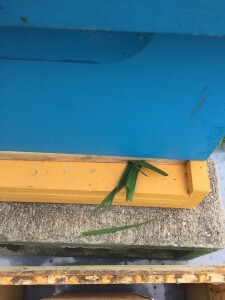 It is because bees, not necessarily from your hive, will slip in the crack between any hive cover you use and the edges of the feeder (unless it has a top.) It is a rare cover—“bee” it top or inner—that sits flush enough to not allow bees in. You can minimize the drowning with insulation tape—the “sponge” of it will fill the gaps. Ants: Sometimes, bees are attracted to the sugar syrup, and there can be seemingly bazillions of them. They annoy bees, but I’m not sure they’re otherwise an issue. Nonetheless, I use cinnamon as a barrier and annoyance back to the ants. Depending upon the feeder I’m using, the weather, etc. – I’ve put cinnamon on the inner cover, and I’ve made a circle around the hive. It smells heavenly to me, and is safely effective. How many boxes? ONE. One!! Only one! 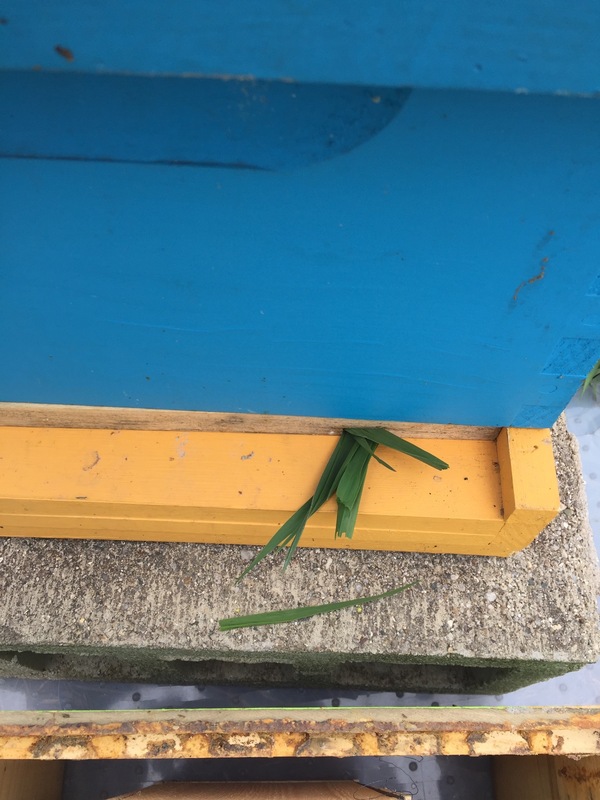 SO many newbees send me pictures of their two- week hive with 2-3-even-5 boxes on it. ONE BOX!! Your new colony is getting smaller the first month, not larger. How many frames? The first time I encountered this, I laughed that someone would actually make this mistake. I’m no longer laughing because it happens to newbees, and understandably. Working with a box of stinging insects is very intimidating to most newbees, and sometimes, to us “oldbees.” It is especially easy to forget to add the last frame if you’ve shorted the box one because of the queen cage. Anyway — if you’re using 8-frame equipment, make sure there are 8 frames in the box once the queen is out (of a package); 10-frame? Ten, etc. You won’t be the first person who put their five nuc frames in the box and forgot to add five more and now have a colossal cross-combed mess … which will also occur if you have nine of ten frames. Bees don’t want more than 3/8 of an inch of space and will fill up every gap. Bee math folks; you can’t argue with biology. They’ll fill in the spaces. And please–keep reading and learning, and don’t become discouraged. The beekeeping learning curve is steep, but the rewards are mountainous.